Before, Sebastian Campione was a member oft he German National Theatre in Weimar, where he could be seen in OSMIN, SARASTRO, FÜRST GREMIN, COLLINE, MONTERONE, CUNO and ASSIMILIANO in Verdi’s”I Masnadieri”. At the Bregenz Festival, the only 32-years old bass singer made his debut as KHEMAL and ABDULLAH in the world premiere of Peter Herbert’s opera “Trans-Magreb”. In Sunday Concerts of the Bavarian Radio, he was HUBERT in Max Bruch’s “Die Loreley”. At the Munster Theatre, Sebastian succeeded in guest performances as SARASTRO. Sebastian Campione was born in Munich and already at the tender age of 8 he sang in the Children Choir of the Bavarian State Opera. He first studied singing with Bettina Kühne and Hartmut Elbert at the Bavarian Singing Academy, before completing his musical studies at the Munich Music and Theatre University with Wolfgang Brendel. While still studying, he took part in various university opera projects and sang at the August Everding Theatre Academy, where he could be seen a. o. as COLLINE, DON ALFONSO, TOLOMEO in “Giulio Cesare in Egitto”, GOBERNADOR in Henze's “Das Wundertheater” and as VATER in “Ein Landarzt”. He was FIGARO and ANTONIO in Mozart’s “Le nozze di Figaro” in a production of the Bavarian Television. He repeatedly portrays the main role in operas from Rossini. In the Pasing Factory he sang SELIM in „Il turco in Italia“ and at the Sonderhausen Castle Festival he was very successful as ALIDORO in “La Cenerentola”. In his native town Munich he was DON MAGNIFICIO. Immediately after graduating, he was engaged as member of the Munich State Theatre at the Gärtnerplatz (2009/2010) where he could be heard as SARASTRO, EREMIT, COLLINE, HALY in “L'Italiana in Algeri” , SAMUEL in the opera “The Pirats” and POOH-BAH in “Der Mikado”. Sebastian Campione works with such conductors as Oswald Salaberger, David Stahl, Ulf Schirmer, Marko Letonja, Stefan Klingele, Stefan Solyom, Stefan Blunier and Massimo Zanetti. In 2015 he received the Rudolf-Bräuer Scolarship for extraordinary vocal achievements. 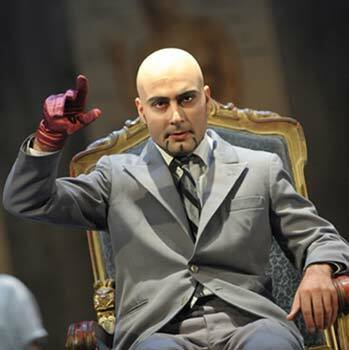 The duke Walter is a grumpy, ill-bred authority figure; Sebastian Campione plays the role appropriately despicable. From the Wuppertal ensemble Sebastian Campione as the demonic duke Walter, Rodolfo’s father, is particularly impressing. In Sebastian Campione the Wuppertal ensemble has found a singer with a flexible, clear bass voice, who gives the character of the Duke of Walter darkness and wickedness. Ensemble member Sebastian Campione sings the relatively cold Duke of Walter with a profound bass voice. This also applies to Sebastian Campione. He doesn't have a black bass voice , but an extraordinary musicality and vocal imagination, turning Conte di Walter into a central character, whenever he appears. Especially in the first act, Sebastian Campione proves he has a powerful voice with both volume and transparency. Bass Sebastian Campione as Sparafucile and mezzosoprano Catriona Morison as Maddalena are in no way inferior to this high level. With black depths Sebastian Campione gives Sparafucile diabolic traits. Sebastian Campione asthe king and the cook has a clear, incisive bass voice.